Hay vs. Straw in the Garden: Which is Better? You are here: Home / Organic Gardening / Hay vs. Straw in the Garden: Which is Better for Mulch? Hay vs. 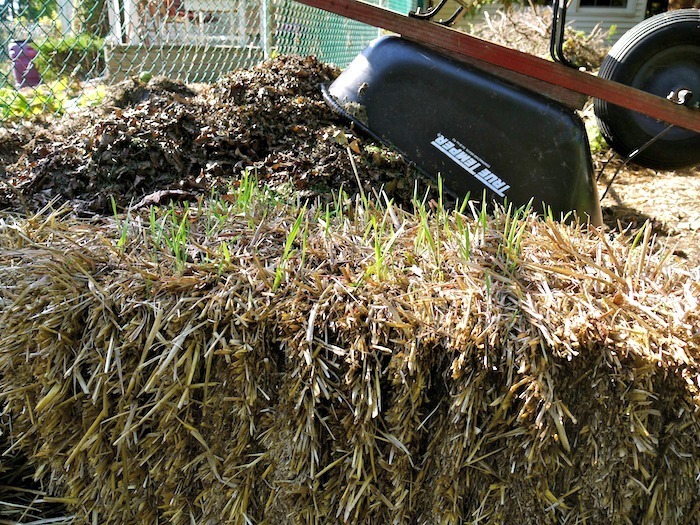 Straw in the Garden: Which is Better for Mulch? First, let me tell you the difference between hay and straw. Straw is the stalks or stems of grains like wheat, barley, or oats after the grain has been harvested. Hay, on the other hand, is grass or legumes that have been cut and dried and is generally used as animal feed. Hay often contains seeds which sprout when used as mulch, which is why there are so many warnings against using it. Straw can also contain seeds if all of the grain was not removed, but in general it is less of a problem. Friends gave us this huge, round bale of hay for our garden. I use hay! Here’s why: Hay is mineral rich; straw has little nutrition. My main concern as a gardener is to build soil that produces nutrient-dense produce. As hay decomposes, it adds many more nutrients to the soil than does straw. I also prefer to work with hay finding it much less stiff. I use it as mulch and as I build lasagna gardening beds. Alfalfa hay is particularly rich and I use it often. So how do I get away with using hay, when there are so many warnings against it? What I do is try to anticipate how many bales I will need next year, and purchase them this year. I leave them out where they will receive rain and snow. Most of the seeds sprout, and the bales begin to decompose. By the time I use them as mulch, or to build a new bed, they already contain worms and other beneficial soil organisms. And weeds are a minor problem, if at all. If you have access to a farmer who has old bales around that he can no longer use to feed his animals, he may just give you the hay. It’s a treasure; take it! So, tell me, have I convinced you that hay is a good choice for your garden? Heirloom, Hybrid and GMO Seeds: What’s the Difference? Love this! Makes so much sense. Why can’t more people think like you?! I know, right? tee hee hee. ps.I love the way you right. You’re blog is such a pleasant and interesting place to visit! Thanks for all the great info! I always learn something from your articles, Susan. Thanks for being faithful! Thanks, Kristie! It’s nice to know that someone is enjoying my labor of love! Hey there, I’m a reader from Homestead Revival hop. I use hay also, but I let the chickens work it over first. They chow down on all of the seeds and those that are sprouting. After two weeks in the chicken run, I put it into the compost bin where it breaks down quickly. It makes a great balance to the chicken manure. I would say that you have the ideal situation!!!! Thanks for the information! We bale our own hay, but have never used it on the garden. I have bought straw before, but did find it stiff, like you said. Also, it still had a lot of grain in it, and sprouted everywhere. I will give this a try this year! Thanks again! If you live in the southern US & have the possibility of getting bermuda grass seed in your hay, I would NEVER use it as mulch–even using this method. Just ONE tiny seed can turn into a permaculture nightmare. It spreads by rhizomes and even a 1/2″ piece can spread & spread & spread &–ugh! Almost all “commercial” hay sold (i.e. anyone who raises hay to sell) in my area is specifically “improved” (i.e. sprayed with broadleaf herbicides) bermuda grass (i.e. they’re killing everything BUT the bermuda grass in their pastures), so not only would it have SOME bermuda, but would have a LOT of bermuda. Anyway–just saying that I agree in principle that hay has a lot of “good stuff” in it vs. straw, but in the southern US (& wherever bermuda grass is rampant) it just isn’t worth the risk. Thanks for the helpful information for southern growers! I disagree, I used to have a lot of crabgrass, bermuda and fescue in my garden, since I have been using HAY for mulch, it doesn’t last. Any weeds that come up in the early spring become more mulch. The bonus is I also have a lot less issues with bugs a well. One year my weeds were being annihilated by Japanese Beetles while my tomatoes were untouched. And this is why a good compost pile is necessary to kill off all harmful seeds, weeds, and bacteria. Make sure it’s at a good temp and no worries. It’s hard to believe so many people know so little about gardening. Something that almost every home had during the world wars. However, now people is so throw away that every piece of produce must look the same. Haha research is key. Put the time in and reap the benefits. Hate me but the truth of the matter Susan is to many people are lazy. Hay is all I have ever used in our gardens as mulch. It’s super cheap here in south Texas and does a great job of keeping the weeds out! I usually lay down several sheets of newspaper on the bare ground and then cover that with six inches of hay. LOVE the stuff! One of the things that I love about blogging is that I learn so much from my readers. I’m getting the idea here that the most important thing is to know what works for you and your region! I often use hay between my beds because that’s all Home Depot and Lowe’s has and normally don’t have problem with it sprouting unless we have an abnormally wet winter or spring. Which we did this year and it’s been in a pain to deal with. I prefer woodchips and fortunately was able to get a truck load to use this year. I’ve only used straw to break up clay soil. Using hay makes more sence because, like you said, it has more nutrients. And waiting a year to avoid sprouts is smart! Thanks for the tips! The pleasure is mine. Thanks for visiting!!!!! I am going to buy a few bales and try it this year. You are so right about it being full of nutrients, plus it is alkalizing.. I have been drinking wheatgrass juice for a couple of weeks now and have noticed a big difference in my body. I can feel how alkaline it is becoming. We found a craigslist ad today for hay that is being given away. It has begun to decompose and is no longer useful for animals. No one else has called about it and we were told we can take all we want! Yay for hay!!!!! We juice, but have never had wheatgrass. Do you like it? We have tons of old bales, but have never used them in the garden. Hay is great for building soil! I use all of the above! I’m lucky enough to have horses that I alternately bed on straw and shavings, and, of course, feed hay. So when everything goes into the compost pile it becomes a delightful mixture. As you mentioned, as long as it is all composted correctly, the weed seeds won’t be a problem because the process (heat, growth) puts an end to all the seeds before it ever hits your garden. I do use the hay I can’t feed to the horses for whatever reason in the gardens. If you are capable of transporting it (or having it delivered) a lot of farmers have many, many unused, rotting, well-composted huge round bales sitting around they’d be happy to have you haul away. That’s about 1,200 pounds of good, rotting hay for free! That’s wisdom – using what you have available! 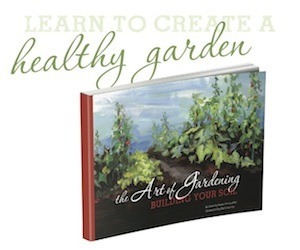 Bet you have a beautiful, healthy garden! Thanks for sharing the information is very helpful. I never thought about “aging” the hay, that’s a great idea! Glad to assist! Thanks for stopping by. hmmmm…..interesting. We just use straw bales that we bale ourselves. What about the cost factor? 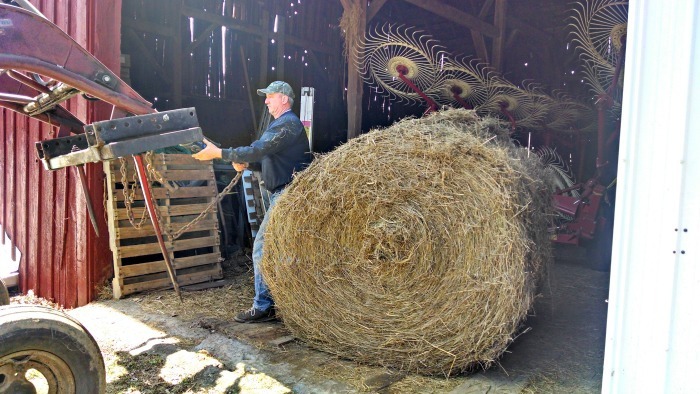 Is hay very expensive where you are from vs. straw bales? I wonder since the droughts and such as affected pastures in many ag areas hay is a dear commodity. Well, if I was baling straw myself, I would most certainly be using straw. Using what we have available is the wisest course of action, I think. In our area (NEPA), I would say that they cost about the same if you buy from a garden center. Hay is less expensive if you purchase it directly from a farmer. Farmers in this area do a lot of haying, but we don’t grow much grain around here, other than corn. Do you have access to manure? That would boost the nutrients in your soil. Nice answer back in return of this question with genuine arguments and telling everything on the topic of that. Awww. You’re sweet! So glad to help. What about sea hay? I use it and it’s great for gardens. Just came across your site (via Prairie Homestead). Very interesting! I know the difference between the two when it comes to animals and which to use for eating and bedding, but this post is a new angle. Thanks for the invite; I’ve already taken you up on it! I see that Jesus and gardening are passions we both share!!!!! I’d suggest going the cover crop route before using hay or straw if you are looking to soil build. Hay and straw do make nice mulches on top of the soil. Be aware that they are both very carbon heavy and need nitrogen to break down. They will tie-up the nitrogen in your soil, depriving your garden for up to three years after incorporation (tilling). If you are going to compost beforehand that would work as long as the straw/hay was composted to a nice finely textured, dark organic matter. Here in the Midwest, we are talking a couple of years. Cover crops might be a better option. They can be hugely beneficial. I work with a farmer’s market farmer and the local CSA they use a combination of oats, annual winter rye, buckwheat and forage radishes (sometimes called tillage or oil radishes). We are buying our first house this year! It has a nice big vegetable garden plot. I won’t be planting vegetables this year, I’ll be working on soil building and getting ready for next year’s harvest. Thanks for your input! I do also use alfalfa and blood meal which are both high in nitrogen. I’ve shied away from cover crops because I don’t want to have to dig it in. Am I accurate with that? or can they just be bent over to act as a mulch? My understanding with high carbon mulches is that only the point at which the soil meets the mulch is there a drop in nitrogen. It’s only when the mulch is dug into the garden that it ties up the nitrogen. I practice no dig gardening and have had wonderful results. How exciting that you’ll be able to have a garden of your own after working so long with other growers! Your wisdom will pay off in the years to come. Also, if you like your garden to be more organic, straw will not be. It will most likely be a GMO crop that has been chemically dumped on. I have used straw in the past, but will be looking into composting hay this year. Great idea! What about the herbicides sprayed on the hay? I have used hay for mulch before that had herbicide residue and it killed most of my vegetable crops it came in contact with. Do you think leaving it out to rot for a year would help? That’s the sadness of this world these days, isn’t it? I would question the grower before purchasing hay to see what he is using, and try to find a source that is not spraying the hay. The answer depends on what herbicide is being used – they can last months to years. This article has some good info: http://compostingcouncil.org/persistent-herbicide-faq/. Hay is also a lot cheaper than straw in NH. Great! I think it all varies, depending on where you are located. Hi Dennis, yes adding hay to your compost is one way to build your soil, but I think that building a lasagna garden would give you faster results. Here’s how: https://learningandyearning.com/2011/04/20/lasagna-gardening/. I am so happy to see this, I get so much of the same comments about seed growth. I use my hay as bedding for my goats and chickens, throw it in a big pile during the winter and use it for my garden every yr. I learned this from my grandma. I get my hay from my neighbor who does not spray anything on his hay so herbicide free. I heavy mulch and drip irrigate and have no problems with weeds at all. There’s just something about grandmothers, isn’t there? Yay for successful gardening! Straw may have been treated, when growing, with a persistent herbicide such as Picloram, Aminopyralid, or Clopyralid, that will poison your garden for years to come, making it unsuitable for growing anything except grass (including corn and other variants). Animals grazing on forage sprayed with this stuff will pass it on in their manure, and it retains its potency. Beware. I understand that hay can have the same problem. We’re poisoning ourselves and not too many seem to care. 🙁 Thank you for the warning!!! If the hay has seeds, you could have a problem with weeds. That’s why I always let the hay sit and rot a bit to be sure all the seeds have sprouted. How cool! I’m definitely going to try that next year! Yeah, I was gonna add too that Alfalfa (hay) was approved for GMO a while ago, so yeah, a sprayed and non-GMO hay from a decent and caring, small famer may be loaded with more minerals, but if it’s NOT from an eco conscious farmer it is GMO by Monsanto with a built in BT toxin and coated in RoundUp. You do NOT want to support that or use that on your garden! BT toxin is a natural pesticide that occurs naturally from the Bacillus thuringiensis bacteria, which is used in both organic and non-organic crops. Organic crops are sprayed with BT. Genetic engineering to allow plants to create the toxin themselves is a common practice. There is no evidence to support claims of adverse effects with either technique, the genetically engineered plants simply don’t need to be sprayed with BT. BT resistant papayas are critical for Hawaii and are the archetypical example why not to perpetuate this misinformation. This incorrect information has been percolating throughout anti-gmo groups for years in attempts to demonize genetic engineering in agriculture (ie: GM Watch). Please don’t contribute to spreading this false information. Also, genetic engineering is not just done by US corporations. I can understand if you object to particular practices (Round-Up use combined with mono-culture crops across the country is wiping out milkweed, which is critical for monarch migratory paths), but those are neither unique to GMOs nor are GMOs used exclusively in this way. A good example is Golden Rice, which was modified using genes from corn so the rice will produce vitamin A. That project was critical to averting a massive vitamin A deficiency crisis amongst poor people living in Asia. TLDR: Please fight bad/ignorant/greedy agricultural practices (rampant in both organic/non-organic & GMO/non-GMO farming). Please don’t demonize genetic engineering. I have enjoyed reading all the comments here. I am wanting to try straw bale gardening this year. My problem, straw bales are not available in my area. Hay is plentiful. In reading these comments here, it sounds as though the bales are being broken up and used in beds. I want to leave the bale intact and plant in the bale.. So, can this be done with hay, with good results? Thank you in advance. Hi Doris, I don’t have any experience with straw bale gardening, but I love the idea. My only concern is if the hay has seeds, your garden will be full of weeds. Otherwise, it should work just fine. Hello, We just got about 20 bales of hay for our chickens and garden. They were new from this years crop. We live in Northern WI and the soil, is well, sand up here. So, can I do a two week getting ready period to get the hay bales ready like all the straw bale websites say to do? Straw here is 5.00 a bale and we got these hay bales for 3.00 a bale. HELP! I’m new to all this gardening and chicken raising…just an fyi why I am asking. 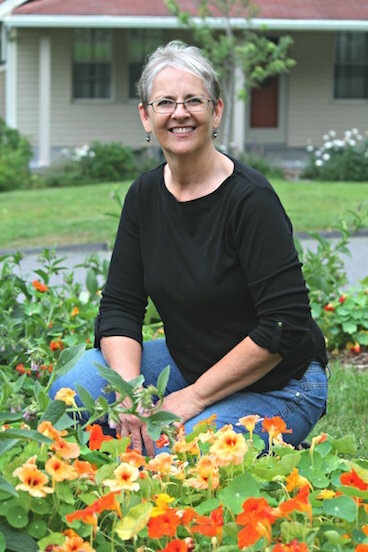 Hi Kim, I don’t have any experience with straw bale gardening, although I love the idea. Personally, if I were going to try it, I would probably use the hay. Having said that, I don’t want to go ahead and tell you what to do. I don’t know if there are weed seeds in the hay, but of course, there can be weed seeds in straw as well, although many people will tell you otherwise. Leaving weed seeds out of the equation, do I think that hay will perform well in a straw bale style garden? I do! Thanks for getting back with me so quick. I’ve never done a garden or chickens. My husband grew up on a farm but hasn’t worked with the bales in a garden either. SO, I will try and remember to let you know how it went. I don’t know how I originally missed this post but it is awesome. It just takes the planning of leaving them out, which I won’t be able to incorporate this year, since I’m starting my beds as soon as this silly snow melts! (We’re on our way with that, thank goodness.) However, I love planning and I have farming friends so I should be able to get some hay to leave out this year, particularly once haying season starts and people are trying to offload their old leftovers from last year. Thanks, Susan. Rosalyn, we also check Craigslist, and can often get hay that is beginning to spoil very inexpensively. We have horses and some of our bales got real wet and molded producing a lot of heat. We put it in a pile since spring and haven’t touched it. Would we be able to use that in our garden? The weeds are ridiculous! Hi Stephanie, that would be wonderful for your garden as a mulch, and it will build soil as well! I have used many different mixes of hay, orchard grass/fescue mix, timothy, alfalfa etc. , and have had none of the problems that you have described. When I can get hay for one to five dollars per bale and straw costs 6-8 I will grow in hay all day long. It is absolutely awesome as mulch as well. I bale my hay as green as possible so when it heat s it “burns ” ills the seeds meaning no weeds . Place it where you want it plant in the bales next spring , caution do not plant when they hay is heating . Thank you, Steven. Great tip! that about all of the mold and/or fungus that will be born in those hay bails by leaving them out all winter? is that okay to spread all around your garden and veggies? Great observation! Jennifer, these are beneficial organisms which are decomposers. my husband thought he was doing me a favor by picking up a bail that got wet of grass hay. At the time I didn’t know the difference, so I mulched this summer in the beans and peppers. Mid season, I noticed there are now grass blades growing up in the bed, the beans are out of course, but I am a little late on getting my garlic in. I was going to weed it first, but by this article, your saying no, don’t weed the grass out? Need to put compost on for the winter, along w/ some bone meal (for summer availability.) What do you sugggest? Hi Liz. No, I am not saying that you shouldn’t weed out the grass before planting garlic. The weeds will choke your garlic. I am saying that while still in bale form, allow the seeds to germinate and then rot. After that the hay will make a wonderful mulch. I treated my hay bales with nitrogen for the conditioning process over a 4-6 day period. Alternating watering only, next day nitrogen and water and so forth. I had a meat thermometer in 2 of my bales. They reached 130 degrees max for about 2-3 days. Then we had a cold snap for about 2 weeks which was extremely rare of Northwest FL this time of year. I read my bales should reach an internal temp of 150 degrees or more. My question is this. Should I start the conditioning process over or should the 130 temp be enough to have burned off the weed seeds in the hay? I certainly don’t want to invest in planting the vegetables only to have the bales full of weeds which is the whole reason I was trying this method of gardening in the first place. Rebecca, I’m sorry to say that I have no experience with straw/hay bale gardening. It’s definitely something I’d like to try but I’m afraid that I don’t have the expertise to answer your question. The hay should certainly absorb some of that moisture. We have a very heavy clay soil at our garden near Montreal, QC. We grow lots of garlic and wanted to try mulching with hay this year so we bought some old bales from our neighbour and left them out all winter but slightly covered. When we started spreading them around the garlic we started getting worried that the hay might spread disease to the crops? Some of the hay had mold, so we stopped using it. We also thought it might attract deer which would be disastrous for the garlic. Any thoughts? Hay and other organic matter will do a world of good to your clay soil. Mold just means that the hay is decomposing, which is what it needs to do to build soil. I doubt that deer will eat moldy hay; we have lots of deer on our suburban property and they leave both the hay and the garlic alone. The tomatoes and beans on the other hand . . .